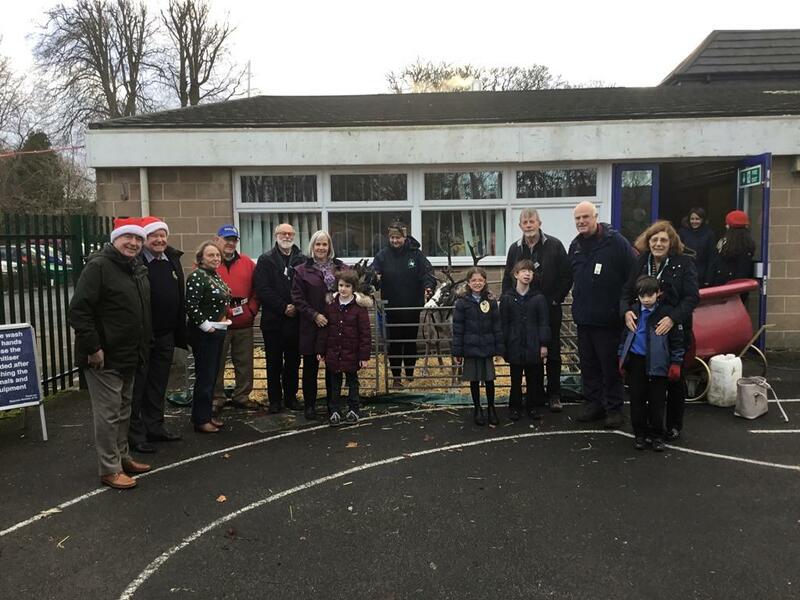 Brooklands Community Special School held its first Rotary Festive Fun Day Last Thursday, supported by the Rotary Clubs of Skipton and Skipton Craven. The event coincided with a range of fun days across the UK, initiated by the national Kids Out charity. A key highlight at Brooklands was a visit to the school by two reindeer, a static sleigh and snow machine, supplied by Riggmore Reindeer of Harrogate. Samantha Emmott, the Brooklands organiser, said: ‘our children and young people benefit greatly from animal visits, as these bring confidence, raise self-esteem, and a highly valued sensory experience’. Children from each of the classes were able to be close-up with the reindeer, and to feed them throughout the school day. A second group of visitors on the day was the celebrated Lempen Puppet Theatre Company. Locally-based, and recent organisers of the acclaimed international puppet festival held in Skipton in October, Liz and Dan Lempen designed a series of mini workshops throughout the day on the Christmas theme of reindeers. The school children were able to create large reindeer with zig-zag legs, small reindeer with finger legs, coloured noses and antlers, and two soft reindeer toys that were gifted to the school for its permanent use. Fran Cracknell, Headteacher at Brooklands said: ‘we are so grateful to the many groups and individuals who have supported this new event at our school. Kids Out days are becoming truly memorable events in our annual school diary’. President Brian Stott of Skipton Craven Rotary Club responded that: ‘it was a real privilege for members of our two clubs to be with the Brooklands students and to help to make possible such a joyous, fun and educational experience. Planning now begins for next summer’s school trip as part of national Rotary Kids Out Day. In June 2017 almost 27,000 children in the UK and Ireland had a really great time supported by their local Rotary Clubs, not least Brooklands staff and students in their day at the Sealife Centre in Blackpool and Blackpool Pleasure Beach. Santa and his sleigh, Rudolf and his helpers are rumoured to arrive at Brooklands on the afternoon of Friday 22nd December!